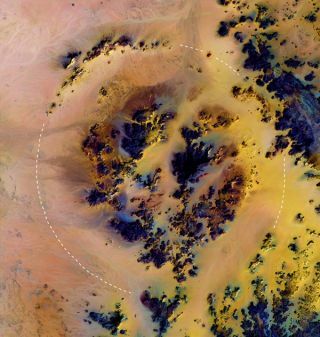 Scientists have discovered a huge crater in the Saharan desert, the largest one ever found there. "Kebira may have escaped recognition because it is so large," equal to the "expanse of the Cairo urban region from its airport in the northeast to the Pyramids of Giza in the southwest," El-Baz said today. "Also, the search for craters typically concentrates on small features, especially those that can be identified on the ground. The advantage of a view from space is that it allows us to see regional patterns and the big picture." The Kebira Crater straddles the border between Egypt and Libya, and is centered at the following coordinates: 24.5 N, 25 E.